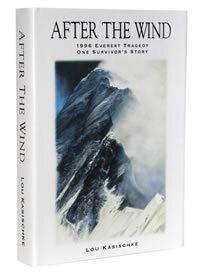 View the Table of Contents of After the Wind. Near the top of Mount Everest at noon, on 10 May 1996, things went wrong. Some climbers lived. Some climbers died. It was the worst tragedy in Mount Everest history. I was there. I was a climbing member of the New Zealand-based expedition led by Rob Hall. This is the story I lived. What went wrong first focuses on the cause of the loss of time at the South Summit in the late morning hours leading up to noon on that fateful day. This loss of time and resulting implications presented a dilemma about what to do. Before noon, there was no life or death Everest story. But then, what happened at noon is the story. I wrote most of these pages in 1997 and 1998. I wrote my account at that time for two reasons. One was because the events were factually complex and, for me, mixed with many emotions. I wanted to write things down to solidify my understanding, my thoughts, and my reflections. I understood what went wrong. I was there. But for people not there, the aftermath reporting of the events was like fog rolling in to obscure and distort a fair understanding about what actually happened. My perspective and analysis were also different from much of what was written and reported at that time, particularly the relative importance of things. Too much was written about things that were colorful for storytelling, but did not matter. What is the truth in this story? It depends on whom you ask. No one has all of it. And some of the truth may never be told. My personal Everest story, within the bigger historic story, is about my experience of being there – living the horror of it. But my story goes beyond and deeper than about what went wrong. It’s also about what went right—how I survived, and perhaps why. After I finished writing, I decided not to publish my account. Instead, I packed the pages away in a file cabinet. When I traveled to Nepal in 1996 to climb Everest, I expected a two month climb, to be followed by a return to my everyday life. Just like every other climb. The photos would eventually collect dust. The memories would gradually fade away. The story of climbing Everest would have an end. But instead, what happened to me did not fade away and continues to influence my everyday life, even now 17 years later. The story I lived never ended. In 1996, I almost selfishly and recklessly died on Everest. In 2011, my wife, Sandy, became seriously ill. We have loved each other for 47 years. We have been married 46 years. Thinking back to the critical moments at noon on 10 May 1996, it was Sandy’s love that came with me to Everest that saved my life. She was a source of inner strength when I needed it. That’s part of the personal story I tell in these pages. As life makes its twists and turns, Sandy now needs me. I regret how close I came to not being here for her today. I also like to think today that my love for Sandy is a force within her to help in her health struggles. I’m publishing this story now as an expression of my love and thanks to Sandy. As I have shared my Everest experience over the years, many people were interested to know Sandy’s part in what happened. My biggest hope and challenge in letting go of these pages is that I write well enough for the reader to understand and value Sandy’s part in the story. As I dusted off and reviewed the pages I wrote so many years ago, I took out things I no longer want to say. Things that are not mine to say. But I added a personally meaningful recent part about my personal story. I have two stories to tell. One is a story about being there—facing that critical situation at noon, and then living a nightmare in the wind, cold, and thin air, with things going terribly wrong and people dying around me. The other is a story about what I heard near the top as I listened in sheer silence—after the wind. A story about the voice of the heart. A love story. The story of how I survived. On May 10, close to noon near the summit of Mount Everest, I gasped for breath. Four or five breaths for every step. Over and over. And over. Four or five breaths. Shift my weight. Then step. Over and over. The frigid dry air burned inside me like cold fire. Four or five ragged breaths. Shift my weight and step. My fingers were white and stiff. Frostbite. I wanted water. More than anything, water. But my water bottles were frozen blocks of ice. Frostbite. No water. Temperature at 30 below zero. High winds. Dehydration. Malnutrition. Little air to breathe. But none of that mattered. Sheer will kept me going. Breathe, breathe, breathe, gasp, shift my weight. Then step. It was getting steeper. I was far above the clouds. Almost six miles high. On a narrow ridge just 400 vertical feet from the top of the highest mountain in the world. Snow spindrift whipped around me. The wind sounded like low-flying jets. An ugly storm slowly boiled up from below. After several weeks of enduring the savage cold and thin air, of climbing rock, snow, and ice, I knew I was close to the top . Thirteen hours of physically and mentally grueling climbing this day was behind me just to get to this point. The top was minutes away. Four or five breaths. Shift my weight. Then step. I was 400 vertical feet from achieving my goal. The top of Mount Everest. Four or five breaths. Then step. Sheer will. Step by step by step. With each step, as a weaker force, I was overcoming a greater one–Everest. I didn't care about anything except reaching the summit. And I was almost there. I sensed that the climbers above me had slowed down. But at first I did not equate that with a problem. I checked my watch. It was close to noon. Noon? How could it be that late? Rob Hall, our expedition leader, had hoped to be on the way down from the top at noon. Trouble? I tried to be calm, but my mind raced to grasp the implications of the time. I felt alone. Isolated. I couldn't talk with anyone. All I could hear was the wind and my own breathing. I looked up at the top. I looked at the climbers above me. I realized things had gone wrong. Very wrong. Climbers were still climbing up, but it was late. I decided I didn't care. Being late didn't matter much at that moment. This was Everest. Climbing past the safety turnaround time I promised to follow didn't matter at all at that moment. Knowing I would be climbing down in the dark didn't matter. What mattered was the top. And I was almost there. Others were still going. Me too. If they could, I could. Nothing could stop me. The already high risk of being there just rocketed far beyond recklessness. This, too, I knew. But I was close. I could get to the top. I wanted to keep going. I had to keep going. But it was too late. We were out of time. The frostbitten fingers? I didn' t care about those, either. Go. Keep going. Others are still going. Me too. I can do this. In climbing, there is only one thing worse than not reaching the summit. And that is when others do, and you don't. I chipped away ice that had caked over my face so I could breathe what little oxygen there is six miles above sea level. With my head down and gasping for air, I continued to climb. Four or five breaths. Then step. Step by step. That first and only voice I heard within me said–I can do this. A veiled force overpowered me. I jammed my ice axe into the snow directly in front of me. I held tight, as my knees buckled. My heart pounded in my ears. Everything else went quiet. Stone silent. I didn't know what I would hear–after the wind–when I listened to the sound of sheer silence. But I was about to find out. Mere moments later, physical toughness and sheer will to climb a mountain of rock, snow, and ice meant nothing. What meant everything was what it would take to overcome a mountain of ambition and pressure to succeed, and to make a hard choice. Was I prepared for that challenge? Hours later, I would be fighting for my life. Hours later, others would be dying on the mountain. Years later, I would be fighting to understand. Years later, I wanted to forget. Years later, I could never forget.